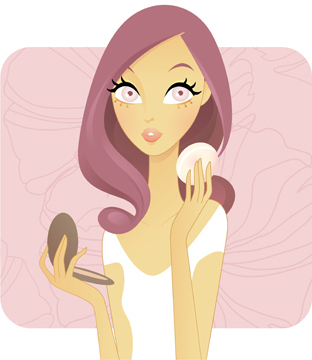 Face powder is the highest selling beauty staple after lipsticks. And it’s vital for making you seem flawless, while also setting all other makeup. But which one to pick? Loose face powders are sheer, easy to blend and offer the most natural finish. Apply with a fluffy brush or puff. Pressed or compact face powders last longer and are extremely portable. They are slightly heavier, helping cover minor blemishes and mattify oily skin. Apply with a puff or cosmetic sponge. Light diffusing face powders contain ultra-fine particles to direct light away from blemishes and fine lines; while oil control versions contain special ingredients like micro-spherical silica to bust greasiness. A setting powder is usually talc-based and it’s purpose is to “set” your foundation and other makeup so that it lasts longer. It does this by soaking up excessive oil and creating a kind of seal over your face, so that environmental aggressors and your own natural skin oils don’t start breaking down the makeup. It’s available in both loose and compact versions. Mineral powder contains titanium dioxide for UV protection, serecite mica for a silky shimmer, kaolin for absorbency and zinc oxide for soothing anti-inflammatory benefits. Being completely natural, it heals and soothes the skin, while keeping the pores clear and clog-free. Plus, the finely crushed particles make it easy to blend, creating a matte, airbrushed and “poreless” effect. It is best applied with a kabuki brush.